Mallorca is the largest of the Balearic Islands and one of the most popular holiday destinations in Spain, known for its lively beaches, sunny weather, gothic architecture, harbors, villages and blue Mediterranean coastline. There are also many adventure and water activities, rich delicacy of food and its rich in its cultural heritage. Despite being famous for it’s lively atmosphere, it still retains its charm and historical splendor, spots like the Cathedral, the Almudaina Palace, the Arab Baths, the Bellver Castle or the Contemporary Art Museum are not to be missed. The south west of the island is where we find the more lively resorts and bustling nightlife, as well as the capital of the island, the cosmopolitan city of Palma with its wonderful selection of shops, restaurants and tapas bars; while the north east of the island is quieter and very scenic, perfect for those looking for a peaceful and relaxing holiday. 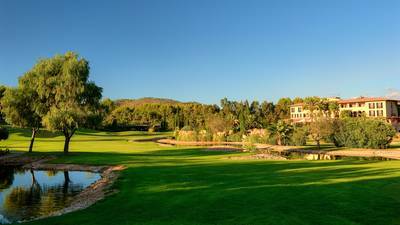 The climate in Mallorca is perfect for golf, with hot summer sun but refreshing sea breezes, little rain, mild winters and an average yearly temperature of 21 degrees. The scenic beauty and rugged features of the islands landscape gives to the two dozens of local golf courses an extra appeal and added challenge for even the keenest of golfers. 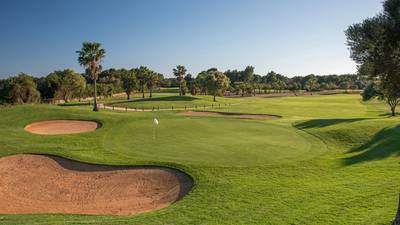 Though not a traditional golfing destination, Majorca has now become a serious competitor of the Costa’s of mainland Spain and also of the Algarve (Portugal) thanks to good standard golf courses and very reasonable green fees. 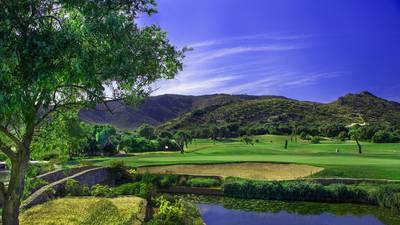 Book your golf tee times on Mallorca with Justteetimes.com, your one stop source for online golf tee times and green fees anywhere. Book 4 rounds of golf at Golf Son Antem (2x East, 2x West) and enjoy the pure and spectacular view of the Randa mountain.